Designing Software Architectures will teach you how to design any software architecture in a systematic, predictable, repeatable, and cost-effective way. 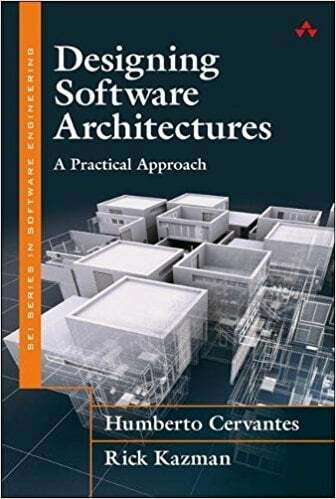 This book introduces a practical methodology for architecture design that any professional software engineer can use, provides structured methods supported by reusable chunks of design knowledge, and includes rich case studies that demonstrate how to use the methods. Using realistic examples, you’ll master the powerful new version of the proven Attribute-Driven Design (ADD) 3.0 method and will learn how to use it to address key drivers, including quality attributes, such as modifiability, usability, and availability, along with functional requirements and architectural concerns. Drawing on their extensive experience, Humberto Cervantes and Rick Kazman guide you through crafting practical designs that support the full software life cycle, from requirements to maintenance and evolution. You’ll learn how to successfully integrate design in your organizational context, and how to design systems that will be built with agile methods. Humberto Cervantes is a professor at Universidad Autonoma Metropolitana Iztapalapa in Mexico City. His primary research interest is software architecture and, more specifically, the development of methods and tools to aid in the design process. He is active in promoting the adoption of these methods and tools in the software industry. Since 2006, Cervantes has been a consultant for software development companies in topics related to software architecture. He has authored numerous research papers and popularization articles, and has also coauthored one of the few books in Spanish on the topic of software architecture. Cervantes received a master’s degree and a Ph.D. from Universite Joseph Fourier in Grenoble, France. He holds the Software Architecture Professional and ATAM Evaluator certificates from the SEI. Rick Kazman is a professor at the University of Hawaii and a principal researcher at the Software Engineering Institute of Carnegie Mellon University. His primary research interests are software architecture, design and analysis tools, software visualization, and software engineering economics. Kazman has created several highly influential methods and tools for architecture analysis, including the SAAM (Software Architecture Analysis Method), the ATAM (Architecture Tradeoff Analysis Method), the CBAM (Cost-Benefit Analysis Method), and the Dali and Titan tools. He is the author of more than one hundred fifty peer-reviewed papers, and is coauthor of several books, including Software Architecture in Practice, Third Edition (Addison-Wesley, 2013), Evaluating Software Architectures (Addison-Wesley, 2002), and Ultra-Large-Scale Systems. Kazman received a B.A. (English/music) and M.Math (computer science) from the University of Waterloo, an M.A. (English) from York University, and a Ph.D. (computational linguistics) from Carnegie Mellon University.